…Also outside the Boeing plant were supporters of Nestora Salgado, the Renton woman who has been jailed in Mexico after running a community police force. Her husband, Jose Luis Avila, and her daughter, Grisel Rodriguez, were among the picketers vying for Kerry’s attention. Avila said that he would like the Secretary of State to take a strong stance urging Mexico to free Salgado, who faces an uncertain wait for trial. Human rights groups and politicians in Washington and Mexico have already backed Salgado’s case. 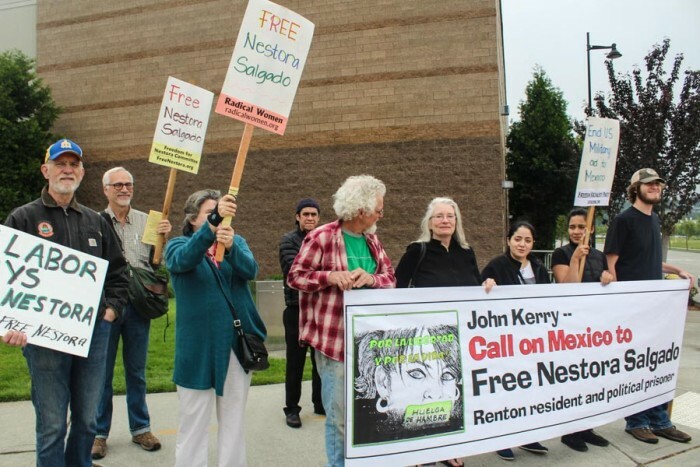 The members of the City Council in Renton, WA have formally moved to recognize Congressman Adam Smith’s efforts to Free Nestora, and have passed a Resolution recognizing the details of her arrest and imprisonment.